There is now an unprecedented crisis unfolding at the border. The flow of illegal immigrant youth across the southern border is on track to reach 130,000 next year—a projected increase of more than 2,000% from 2011. The White House estimates the cost of “resettling” these illegal immigrants in the United States will reach $2.3 billion in a single year. This crisis is a direct and predictable result of the President’s sustained and deliberate campaign to dismantle immigration enforcement. His administration has announced to the world that our nation’s immigration laws will not be enforced and that, in particular, they will not be applied to foreign youth. The world has heard and heeded the President’s message. A wave of illegal immigration has overwhelmed authorities, producing a completely preventable humanitarian crisis—and further diminishing the integrity of our national borders. And there is but one way for the crisis to end: for the President of the United States to declare to the world: "Do not attempt to come here illegally. Our border is no longer open. Our laws will be enforced." A local TV station in Texas recently issued a telling report. They revealed that information is being disseminated in Central America urging people to make the life-threatening trek north in pursuit of amnesty: "A mother and child told Channel 5 News that the message being disseminated in their country is, 'go to America with your child, you won't be turned away.'" In response to this emergency, the Administration has taken steps to incentivize even more illegal immigration. Secretary of Homeland Security Jeh Johnson—who swore an oath to uphold the law—just last week announced that 560,000 illegal immigrants will be given formal work authorization in the United States despite average unemployment rates of 20 percent for American teenagers without high school diplomas. Meanwhile, the President’s Labor Department has unilaterally authorized the admission of an additional 100,000 guest workers to compete against unemployed Americans. Among those who suffer the most as a result of these policies are African-American and Hispanic youth. The nation’s chief law enforcement officer, Eric Holder, has even described amnesty as a “civil right.” Of course, if amnesty is a civil right then immigration laws can never be enforced and amnesty can never be denied, because such rights are immutable. With detention facilities, asylum offices and immigration courts overwhelmed, enough migrants have been released temporarily in the United States that back home in Central America people have heard that those who make it to American soil have a good chance of staying. "Word has gotten out that we’re giving people permission and walking them out the door," said Chris Cabrera, a Border Patrol agent who is vice president of the local of the National Border Patrol Council, the agents’ union. "So they’re coming across in droves." For all practical purposes, the Administration’s policy is that anyone in the world, of any age, is free to come and stay in the interior of the United States, to illegally work and receive taxpayer benefits, so long as they are not caught, tried, and convicted of a serious crime. And even then, thousands of criminal aliens are released each and every year. Unfortunately, the President remains committed to escalating—rather than ending—the lawlessness. It therefore falls on the shoulders of Republicans alone to make the case for new leadership that will restore America’s borders. Republicans are the last line of defense for the American worker. They are the last bulwark for the rule of law. That means prominent Republicans must cease issuing ill-conceived statements that it is somehow morally or legally improper for the United States to apply immigration laws to illegal immigrants who arrive by a certain age. As USCIS Council President Kenneth Palinkas has warned, these arguments will produce not merely a one-time amnesty but a “perpetual amnesty.” Palinkas explained that such promises lead to “extending birthright citizenship in the future to include the foreign citizens of other countries” (as opposed to the children of illegal immigrants born in the U.S.). It cannot be the policy of the United States that any of the 2 billion people in the world who have yet turn to turn 18 have a right to illegally enter the United States and claim residency. For the law enforcement to function, lawmakers and law officers must encourage—not discourage—the law’s application. Imagine, for instance, that the Administration announced it would no longer enforce any tax fraud violations in amounts under $1 million, as a matter of “prosecutorial discretion.” Would we not see a massive spike in tax fraud in amounts less than a million dollars? It would be a unilateral repeal of an entire section of the criminal code by the Executive Branch. Now further imagine the Administration expanded the policy to say that tax fraud—in any amount—will be permitted so long as the proceeds are transferred to a minor relative. After all, this minor, the Administration argues, received the money “through no fault of their own” and so it would be morally improper to apply the law in such cases—it would be a violation of their “civil rights.” Does anyone doubt this would lead to a total collapse of tax enforcement nationwide? Of course not. Yet this administration has effectively adopted the philosophy that immigration law, on its own, cannot be enforced in the interior of the United States and that, further, foreign nationals who arrive by a certain age—and their relatives—have a “right” to become citizens of the United States. It is time for the GOP to look the American people in the eye and say: We will end the chaos. 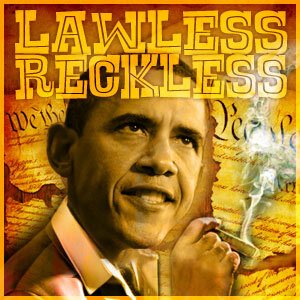 We will stop the lawlessness. And we will restore for the American people the immigration protections that have been callously stripped away by this Administration. Jeff Sessions (R-AL) is the Ranking Member of the Senate Budget Committee and former Ranking Member of the Judiciary Committee. He is also a former U.S. Attorney and Attorney General for the State of Alabama.